With a length of 100 kilometers and a width of 40 kilometers, this peninsula in Southeast Italy resembles the heel of a boot, and has a much different history from the rest of the Italian mainland. Beginning in the 5th century, Salento belonged to Magna Grecia and was linguistically and culturally more influenced by Greece than by Rome. The names of cities such as Gallipoli are evidence of this. Even today, the dialect spoken in Salento is quite different from the surrounding dialects. The same is true of the region's architecture. The whitewashed houses with flat roofs are exemplify the Greek style. 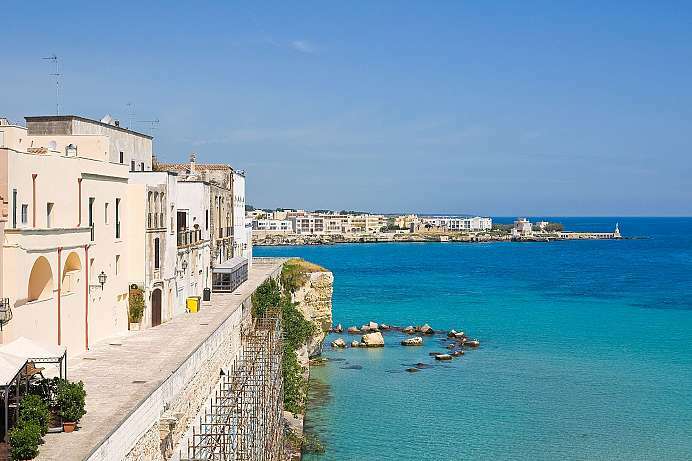 In the far south of Salento a beautiful coastal road leads through villages and along rocky coastlines to the rugged Capo Santa Maria di Leuca. Where today stands a church dedicated to Mary, with a supposedly miracle-working image of the Madonna, was once during ancient times a temple of Minerva. From the lighthouse one has a great view. On a clear day you can see all the way to Albania. Boat trips along the magnificent rocky coast, interspersed with natural grottoes, are on offer. The wine-growing town with about 29,000 inhabitants and a cheerful atmosphere is probably of Greek origin dating back to pre-Christian times. The most striking building is the Franciscan church of Santa Caterina d'Alessandria. It was built in the 14th century in the Romanesque style. Inside one will find frescoes depicting scenes from the Apocalypse, the Book of Genesis and the Life of Jesus. 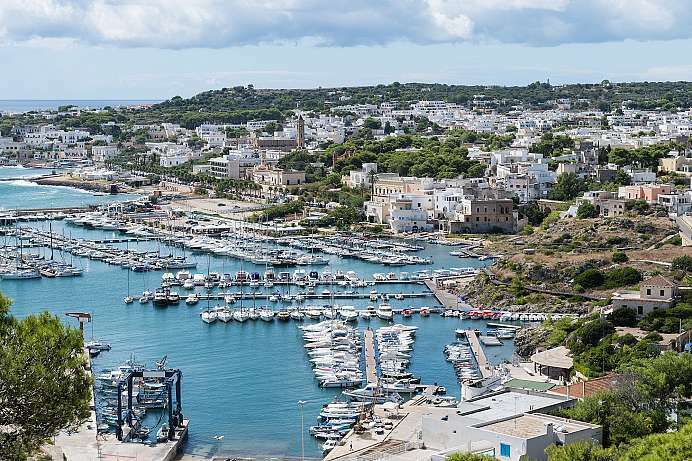 2,500 years ago Greek settlers founded the port town and called it Kallipolis (English: “beautiful city”). Today the beauty lies mostly in the old town. It is located on a rocky island and surrounded by water on three sides. Gallipoli consists of the village “Borgo” and the old town “centro storico”. Southern Apulia between the Adriatic Sea, the Ionian Sea and the Gulf of Taranto is one of the most remote and least developed provinces in Europe. 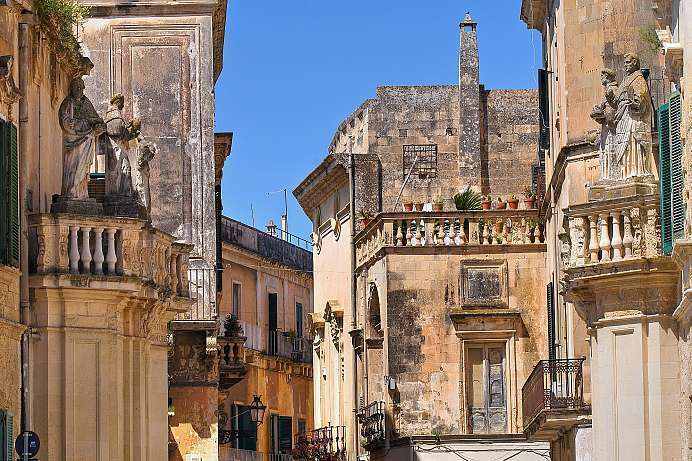 Lecce is the capital of the region known for the production of olive oil. Called the “Florence of the South”, the city boasts numerous monuments created in an exuberant style referred to as “Lecce Baroque”. Despite its history, which is always present, the city is young and vital. This is owed to the university and the many students who inhabit the places especially in the evening. South of the city a scenic road leads along the coast through picture-book villages and along cliffs to the rugged Capo S. Maria di Leuca. A temple dedicated to the goddess Minerva once stood on the site now occupied by the Shrine of Santa Maria. Spectacular views all the way across the sea to Albania can be enjoyed from the lighthouse. Tourists can also take boat rides along the rocky cliffs filled with natural grottos. 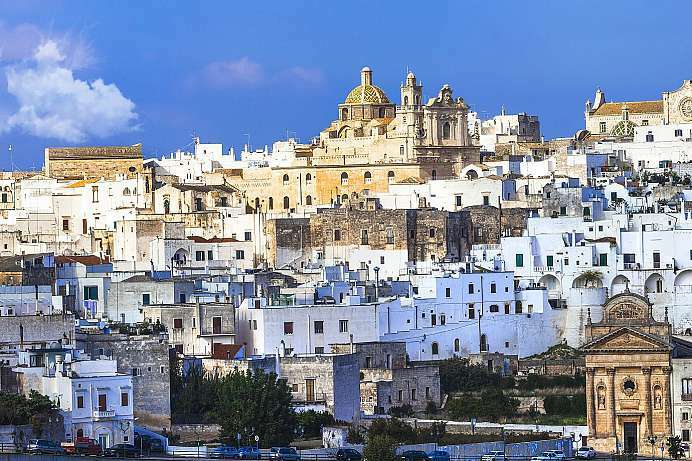 Ostuni is also known as the “Città Bianca”, because all the houses except for the churches are whitewashed. An oriental flair is present in the narrow streets which are spanned by arches and showcase confusing nested houses with many outdoor stairs. The dark green shutters, the laundry hung out to dry and the pink bougainvillea all contribute to a kaleidoscope of color. 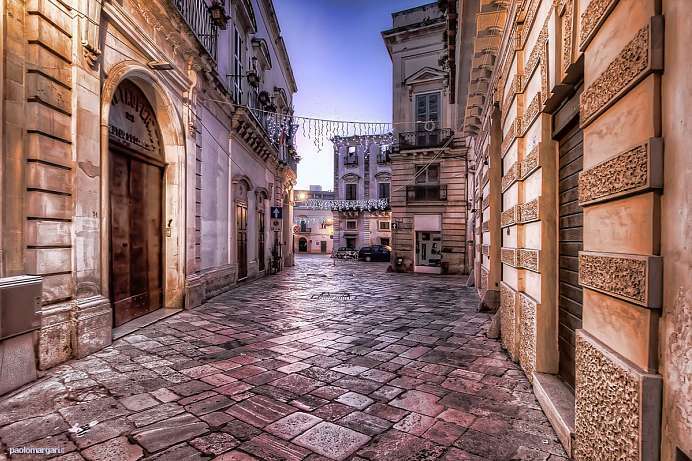 Ostuni has been whitewashed since the time of the Middle Ages to allow for a brighter light in the narrow streets. In addition, the whitewash was to protect against the spread of the plague. A scenic road with sweeping views over the flat countryside leads around the historic center. This city of 5,500 marks the eastern point of Italy. 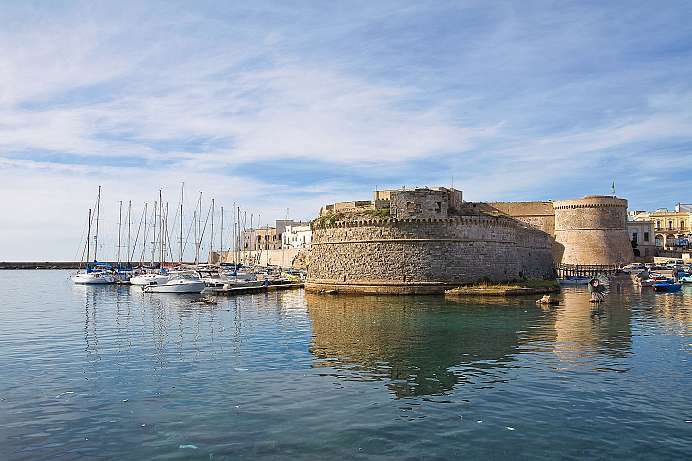 Like many towns in the vicinity, Otranto was founded by the Greeks. The city's main attractions are the Cathedral with its famous floor mosaic containing depictions of ancient sagas, the fortress and the nearby beaches. More beaches can be found just to the south in Porto Badisco and Aquaviva. Farther south, where the Ionic Sea begins, the shore is bordered by rugged cliffs.